Absolutely NOTHING says summertime quite like a watermelon. It is hands down my favorite fruit, it evokes hilarious memories from my childhood watching my grandfather spit out the seeds and it seems to just get sweeter as the summer heat rises! 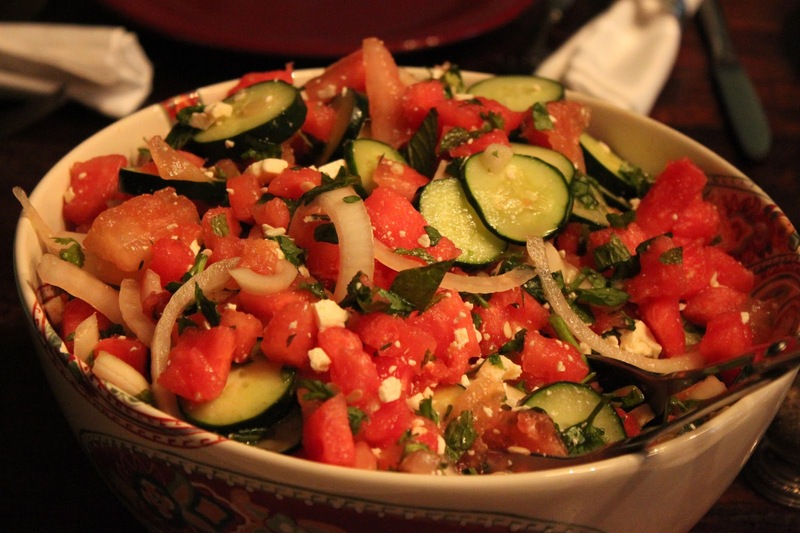 A few years ago a friend of mine gave me a recipe for a watermelon salad with feta and mint. It was heaven! I have made it for countless cookouts and backyard barbecues. With that salad constantly in the back of my mind when watermelons finally come into season (and trust me I wait for it all year like a kid waits for Santa) I thought I would make it for dinner one night. This plan was quickly thrown out when I went out to my garden and found 4 huge cucumbers on the vine that I knew needed to be picked and used. Even though the delicious cucumber and onion salad is one of my favorites as well, I had my heart set on watermelon! I wanted watermelon and I was fully prepared to pout about it! Alas, my sister-in-law, Maggie, came to the rescue as she so often does when reason seems to be the last thing on my mind. She had pulled this recipe from cooking light and it appealed to all my culinary needs! I could have my watermelon (tell the kid to stop throwing a temper tantrum on the floor, she will have her watermelon), I could use the fresh cucumbers from my garden and all was right with the world! 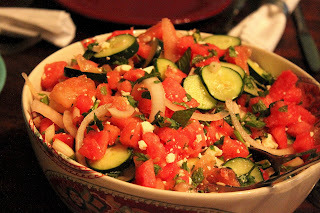 In the end it turned out for the best as it combined two of my favorite summer salads into one that can only be described as a southern summer evening in a salad bowl...it was perfection! Combine first 4 ingredients in a large bowl. 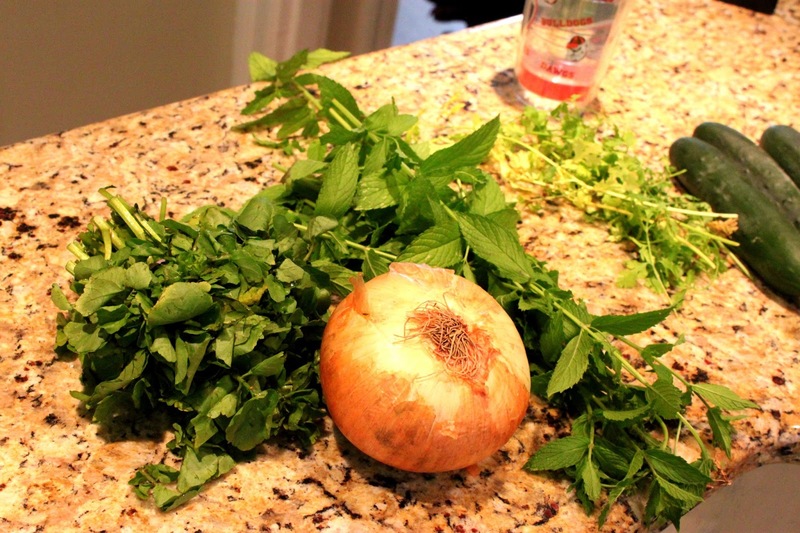 Combine mint and next 3 ingredients (through oil) in a small bowl, stirring with a whisk. Add juice mixture and salt to watermelon mixture; toss gently to coat. Sprinkle with feta; garnish with mint sprigs, if desired.